Jaden McDaniels is a top five player in the country. He may even be the best. If that proclamation was made three months ago, it would have been met by some pretty heavy backlash. After 16 games in the NIKE EYBL, you’d now be foolish for thinking any different. 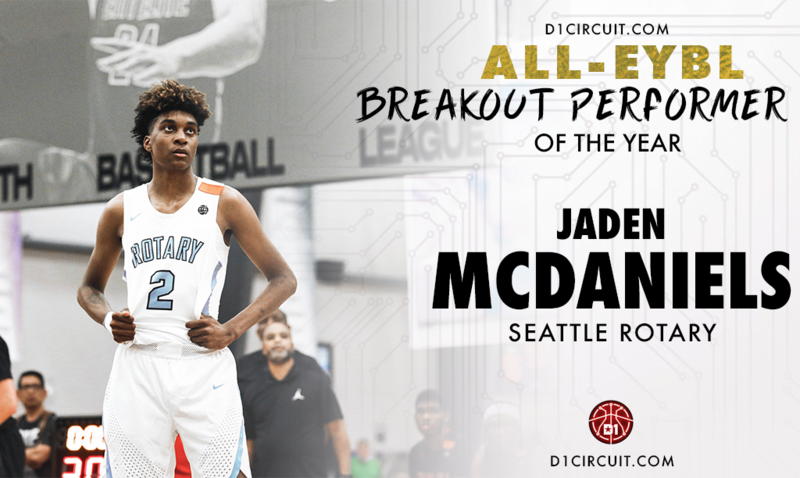 McDaniels put up a season to remember this spring, catapulting himself into the conversation for best player in the 2019 graduating class while helping Seattle Rotary Style to their first Peach Jam bid since 2012. Was the EYBL everything it’s cracked up to be? McDaniels was matter-of-fact. The 6-foot-10 swingman - and swingman is emphasized due to the backlash we saw after calling him a big man earlier this season- can do a bit of everything on the court. In 10 wins and six losses, McDaniels averaged 19.2 points, 9.3 rebounds, 1.9 assists and 1.4 blocks. As confident as he is, the success even caught McDaniels by surprise. In the state of Washington, he was a known commodity at the high school level. How fast would he rise to national prominence? McDaniels is much more than a big man, employing guard-like skills and an evolving mid-range and perimeter jump shot. His older brother Jalen plays for San Diego State, and he comes from a very close-knit family. When McDaniels decided to join Rotary for his final grassroots go-round, Hennings knew he could be special. He turned out to be historic. Hennings final statement about McDaniels is something we can all agree upon. McDaniels will get to write that story, and his thoughts on his immediate future were crystal clear when asked what he’s looking forward to in July.